The Australian Open is already up and running with the opening day of the tournament seeing a number of exciting matches, shocks and upsets. Day 2 saw the end of the first round with a total of 53 seeded players (28 men and 25 women) proceeding to the second round which is six more than last year. However, not all the seeded players had it easy on Day 2 as the likes of Agnieszka Radwanska, Timea Bacsinszky, and Alexander Zverev were given a run for their money before prevailing over their opponents. 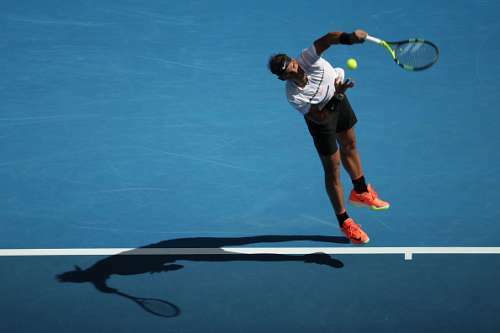 Rafael Nadal made a winning start to his campaign by beating Germany’s Florian Mayer in straight sets and will now take on a very familiar opponent in Cypriot Marcos Baghdatis in the second round. Reigning champion Novak Djokovic and last year’s semi-finalist both progressed into the second round with comfortable wins over Fernando Verdasco and Dustin Brown respectively. While Grigor Dimitrov had an easy win over wildcard Christopher O’Donnell in his match, David Ferrer, who had been going through poor form lately, started the tournament much better than expected as he thrashed wildcard Omar Jasika 6-3, 6-0, 6-2. Serena Williams began her tournament well by defeating Belinda Bencic in straight sets, while 2014 runner-up and sixth seed Dominika Cibulkova had a tough first set against Czech Allertova, which she won 7-5 before completely outplaying her in the second set with a 6-2 win to take the match in straight sets. Last year’s semi-finalist Johanna Konta endured a similar outing in her first round match against Kirsten which she won by the same scoreline. US Open runner-up Karolina Pliskova also had a good start to her tournament as she bashed her Spaniard opponent Sara Sorribes Tormo 6-2, 6-0. The match of the day was 20th seed Ivo Karlovic versus 31-year old Argentine Horacio Zeballos which lasted 5 hours and 15 minutes, thus being the second longest match in Australian Open history and was only 38 minuted shy of the 2012 Australian Open final between Nadal and Djokovic. The Argentine took the first two sets 7-6, 6-3 and was looking all set to win his first ever match at the Australian Open but the 6’11” Croatian fought back hard and took the next three sets 7-5, 6-2, 22-20 to take the match. Karlovic served a total of 75 aces throughout the match. The performance of the seeded players in Day 2 was much better compared to that of the opening day and most of the seeded players had a smooth passage to the second round. However, there were three seeded players who bit the dust in Day 2. They were Samantha Stosur, Timea Babos, and Feliciano Lopez. Samantha Stosur was Australia’s biggest hope in the women’s singles tournament and she was up against world no. 81 Heather Watson. The Brit played a very balanced game right from the beginning and took the first set. 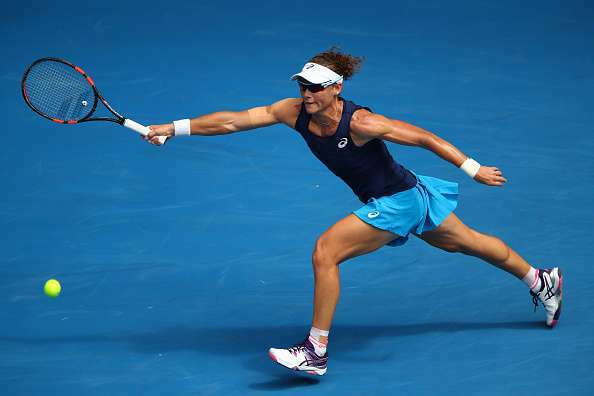 However, Stosur was not one to back down and fought hard, with her serve being the biggest weapon in her arsenal. Stosur eventually came back to win the second set. However, Watson kept her calm and eventually defeated Stosur in the third set to reach the second round. This is Stosur’s third consecutive first round defeat in 2017 and her second successive first round defeat in the Australian Open. Despite the 6-0 scoreline, the third set lasted 48 minutes as there were many exciting deuces throughout the set. Watson will now take on American qualifier Jennifer Brady who beat Belgian lucky loser Maryna Zanevska in straight sets. 25th seeded Hungarian Timea Babos’ poor singles performance in 2017 persisted as she slumped to her third consecutive first round defeat in 2017. Unlike the other two, Babos lost in straight sets, this time. 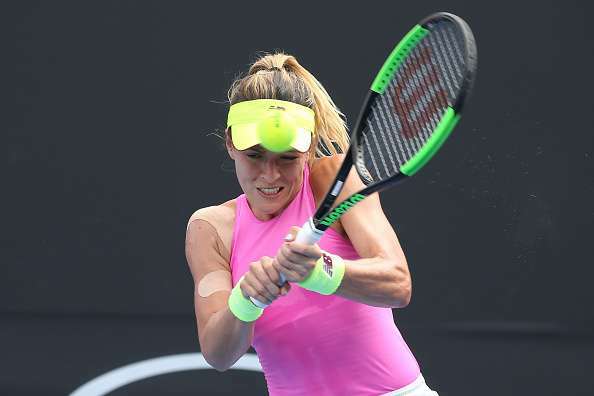 She was up against American Nicole Gibbs in the first round and the first set seemed pretty exciting with neither player willing to make the match a one-sided affair. Gibbs eventually won the first set 7-6 by winning the tie-break 7-3. The second set began well with both players holding their serve before Babos broke to take a 3-2 lead, but Gibbs rebounded well by breaking her serve the very next game. Trailing 4-5, Babos was serving to stay in the match and was 0-30 down due to two unforced errors. She came back to lead 40-30 but Gibbs’ forehand made the difference as she would eventually win the match with a forehand winner. Gibbs will now take on compatriot Irina Falconi in the second round. 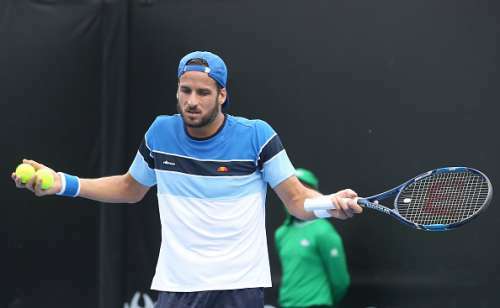 28th seeded Spaniard Feliciano Lopez was the only men’s seeded player to get eliminated in Day 2 as he lost to world no. 48 Fabio Fognini in straight sets. The match began with both players breaking each other’s serve in the opening two games of the first set. Both players held on to their respective serves before Fognini made the decisive break at 5-5 to go up 6-5 and took the first set 7-5 thanks to a backhand error by Lopez. In the second set, Fognini was in full control and made a couple of breaks to go up 5-2, before Lopez broke his serve to stay in the set. However, Fognini broke his serve to take the second set 6-3. The third set was looking to be very exciting with none of the players being able to break the other’s serve and the score was tied at 5-5. Like in the first set, Fognini made the decisive break to go up 6-5 and held his serve in the final game to win the match and reach the second round of the Australian Open for the first time since 2014. It’s only a few hours before Day 3 and the second round of the tournament commences with the likes of Federer, Murray, Wawrinka, Kerber, Venus Williams, Muguruza and Kuznetsova going out with the aim of leaving the Rod Laver Arena with a berth in the third round confirmed.